A utopian dream and some entertainment on the side. Michael Schitnig and Marleen Leitner (from Studio Asynchrome) reinterpret Bruno Taut's "Der Weltbaumeister" ("The World's Master Builder", 1919) in a new, unique way by animating 28 original drawings in a tale of utopian dreams and philosophical entertainment about the delicate, complex relationship between architecture and humans. In Asynchrome's three-act narration, cathedral stars spin and dance and alter their form, up to a moment when "space is not just a feature of a shape - it is a feature of humans" (as the story says). Their philosophical research leads to the awareness that, over the course of history, people seem to have lost their belief in utopia, since contemporary architecture seems to have become more anonymous and to have lost its original sparkle of utopianism during the transformation from cabin, to house, to cathedral, to glass and crystal skyscraper. 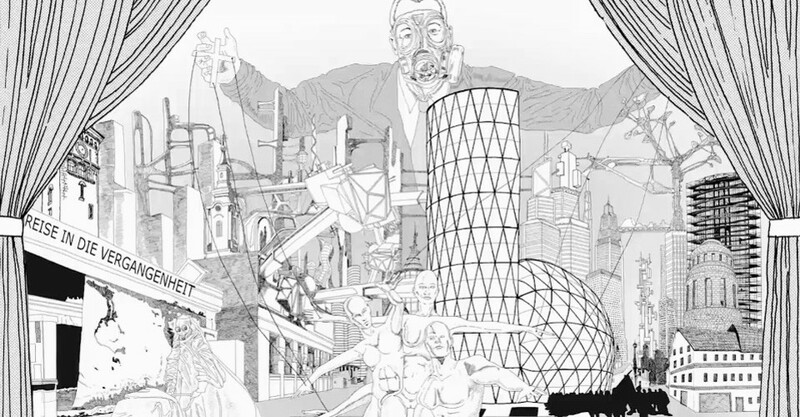 The short film was created as part of the architecture diploma "No-Man's-Spaces - On the Tracks of Utopia" at the Faculty of Architecture of Graz (Institute of Contemporary Art) and opened the screening of the film festival of the Architekturzentrum Wien (Center of Architecture Vienna) at the Museumsquartier in 2015.